Elizabeth Debicki (born 24 August 1990) is an Australian actress. After making her feature film debut in A Few Best Men (2011), she appeared in The Great Gatsby (2013) for which she won the AACTA Award for Best Actress in a Supporting Role, and starred in the Sydney Theatre Company production of The Maids with Cate Blanchett and Isabelle Huppert (2013/14) for which she received a nomination for the 14th Helpmann Awards. She has also appeared in the films Macbeth (2015), The Man from U.N.C.L.E. (2015), Guardians of the Galaxy Vol. 2 (2017) and Widows (2018). Debicki was born in Paris, to a Polish father and an Australian mother of Irish descent. Her parents were both ballet dancers. When she was five, the family moved to Glen Waverley in Melbourne, Australia. The eldest of three children, she has a younger sister and a brother. Debicki became interested in ballet at an early age and trained as a dancer until deciding to switch to theatre. A student at Huntingtower School in eastern Melbourne, she achieved two perfect study scores in Drama and English and was the school's dux when she graduated in 2007. In 2010, she completed a degree in drama at the University of Melbourne's Victorian College of the Arts. In August 2009, she was the recipient of a Richard Pratt Bursary for outstanding acting students in their second year of training. Debicki is 188 cm (6 ft 2 in) tall. Debicki made her film debut with a brief appearance in the 2011 film A Few Best Men. After seeing Debicki's audition reel, director Baz Luhrmann flew her to auditions in Los Angeles. In May 2011, Luhrmann announced that she had been cast as Jordan Baker in his 2013 film The Great Gatsby. In December 2012, Debicki was the subject of a photo shoot for Vogue Australia. From June to July 2013, Debicki played Madame in the Sydney Theatre Company's production of Jean Genet's play The Maids with Cate Blanchett and Isabelle Huppert. She won the best newcomer award at the Sydney Theatre Awards. 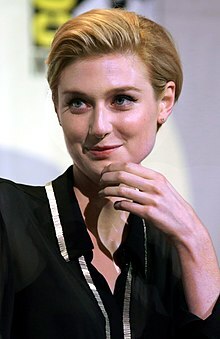 Debicki appears in a 13-minute short film, "Gödel, Incomplete", and appeared as a guest star in the third season of the Australian TV series Rake. She played the villain in the Guy Ritchie-directed film adaptation of The Man from U.N.C.L.E. (2015). She learned to drive on the set. In 2015, Debicki had supporting roles in Justin Kurzel's adaptation of Macbeth and Everest. Debicki plays the lead in an eight-hour television series, The Kettering Incident, and a supporting role, Jed, in the miniseries The Night Manager. She was then cast in the film The Tale. In May 2017 she portrayed the role of Ayesha, the leader of the Sovereign people in the Marvel Studios film Guardians of the Galaxy Vol. 2. She will return for its sequel, Guardians of the Galaxy Vol. 3. Debicki also appeared in the film The Cloverfield Paradox, released on Netflix in February 2018, as Mina Jensen. She voices the role of Mopsy in Peter Rabbit. 1 2 Hardie, Giles; Hornery, Andrew (20 August 2011). "Leo sweeps into Sydney". Brisbane Times. Archived from the original on 7 March 2012. 1 2 "Baz Luhrmann casts VCA graduate Elizabeth Debicki in The Great Gatsby". University of Melbourne. 25 May 2011. Archived from the original on 7 March 2012. 1 2 Blake, Elissa (19 May 2013). "From Paris with love". The Age. Archived from the original on 2 September 2014. 1 2 "New Aussie in Hollywood, Elizabeth Debicki, steals the film in the upcoming spy drama, Man from U.N.C.L.E.". mindfood.com. 3 August 2015. 1 2 Lockyer, Daphne (7 February 2016). "'I want a co-star I can look in the eye': Meet Elizabeth Debicki, the 6ft 2in actress who's tipped for the top". Daily Mail. 1 2 Rule, Dan (2012). "True Hollywood Story". Melbourne University Magazine. Archived from the original on 9 April 2013. ↑ Bowen, Sholto (1 February 2008). "From the Principal". The Huntingtower Bulletin. Archived from the original on 18 May 2013. ↑ Fleming, Mike (11 May 2011). "Newcomer Elizabeth Debicki To Play Jordan Baker In The Great Gatsby". Deadline Hollywood. Retrieved 13 June 2011. ↑ Bulbeck, Pip (6 September 2011). "Baz Luhrmann's $125 Million The Great Gatsby Begins Production in Sydney". The Hollywood Reporter. Retrieved 6 September 2011. ↑ Anderton, Ethan (9 May 2017). "Guardians of the Galaxy Vol. 3 Is Bringing Back Elizabeth Debicki as Ayesha". slashfilm. ↑ Horst, Carole (1 November 2017). "AFM First Look: Elizabeth Debicki, Gemma Arterton in 'Vita & Virginia'". Retrieved 17 November 2017. ↑ "The Red Barn – National Theatre". www.nationaltheatre.org.uk. Retrieved 17 November 2017.